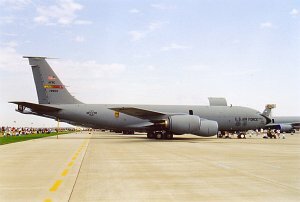 The Boeing KC-135 Stratotanker is a four-engined air-to-air tanker and cargo aircraft produced by the US-American manufacturer Boeing Company. The KC-135 was basically powered by Pratt & Whitney J57-P-59W turbojet engines (61,2 kN / 13750 lbf). The maximum fuel load of the variant KC-135R is 90.719 kg / 200.000 lb. The maximum cargo payload is 37.648 kg / 83.000 lb.